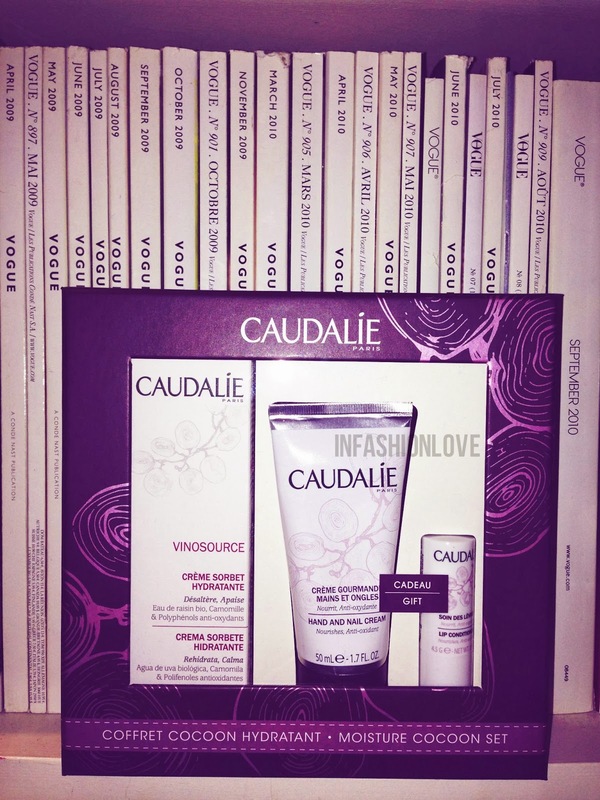 INFASHIONLOVE.COM: Gift Idea: Caudalie Moisture Cocoon Set! Hey Beauty Lovers! This gift set would be great for a mother or an auntie or anyone really who is suffering from dehydrated skin, but perhaps a more mature person as the packaging is quite elegant and classic. A comforting skincare set that is designed to help instantly calm and hydrate skin, which is either normally dehydrated or is aggravated by the winter's cold. It would be suitable for all skin-types as the facial moisturiser has a lightweight gel texture. You get three lovely Caudalie products in this box: Moisturising Sorbet 40ml, which is a gel-cream; Hand and Nail Cream 50ml, which is anti-oxidant rich and has a festive orange scent; and finally a Lip Conditioner.